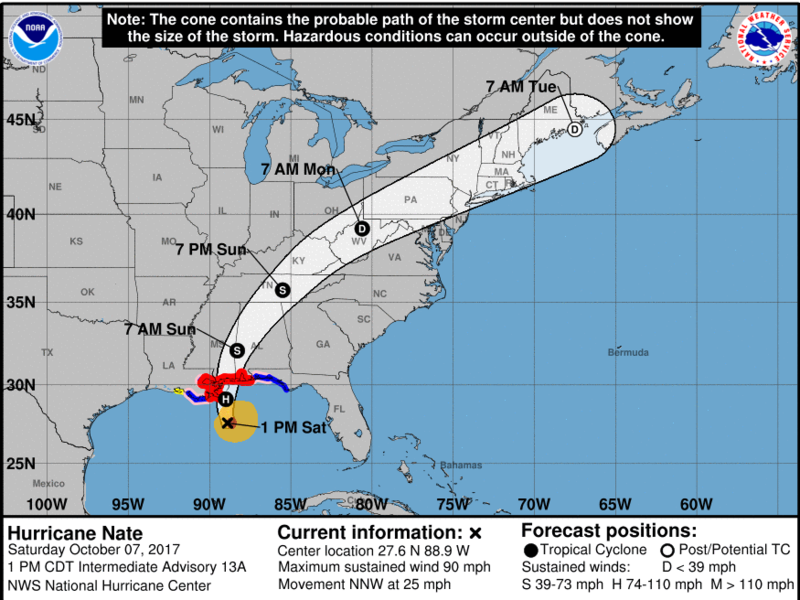 Hurricane Nate Makes Second Landfall In Mississippi : The Two-Way The storm made landfall a second time early Sunday, this time near Biloxi, Miss., with winds of 85 mph. Then-Tropical Storm Nate caused damage near Goascoran, Honduras, on Friday and was blamed for several deaths across Central America. It strengthened to a hurricane as it made its way toward the U.S. Gulf Coast. Earlier in the evening the storm had been gaining strength and speed over the Gulf of Mexico and was expected to make landfall along the central U.S. Gulf Coast as a Category 2. "It is moving at an extremely fast rate," said Louisiana Gov. John Bel Edwards at a briefing Saturday, "almost unheard of for a storm of this type." In its 1 p.m., CT advisory, the National Hurricane Center said the storm was located about 100 miles south of the mouth of the Mississippi River and headed north-northwest at 25 mph. It had maximum sustained winds of 90 mph. "This is a very strong storm," Edwards said. He asked that residents be prepared to ride out the storm by 3 p.m. local time Saturday and to keep off the roads. That was five hours earlier than the time Edwards had requested a day earlier. A hurricane warning is in effect from Grand Isle near the southern tip of Louisiana stretching to the Alabama-Florida border, including metropolitan New Orleans and the Mississippi Gulf Coast. "Everybody in this area needs to prepare for hurricane-force winds," said Mike Brennan, senior hurricane specialist with the NHC, adding, "we are very concerned about storm surge." A storm surge warning covers much of the region, including around Lake Pontchartrain in the New Orleans area. Forecasters said floodwaters could reach 11 feet above ground level, "so that is life-threatening," Brennan said. "The deepest water will occur along the immediate coast near and to the east of the landfall location, where the surge will be accompanied by large and destructive waves," the NHC said in its advisory. Grand Isle is under a mandatory evacuation, as are parts of New Orleans. Other parts of southeastern Louisiana are voluntary evacuation areas. Edwards said emergency shelters are open in every parish where evacuations have been called. "It is critical that everyone told to evacuate do it now," Edwards said at the noon briefing, local time Saturday. He said that three-quarters of hurricane fatalities are caused by water and that motorists could be fooled by deceptively deep water. A mandatory curfew begins at 7 p.m. Saturday in New Orleans and lasts "until the risk has passed," said the city police department in a statement. Officials in Mississippi recommended evacuations for all low-lying areas and for people living near waterways and in mobile homes. Meantime, Hurricane Nate has put the central Gulf economy at a standstill, NPR's Debbie Elliott reports for Weekend All Things Considered. "Not only are businesses closing and boarding up, but shipping and oil and gas production is halted. The U.S. Coast Guard has closed all the major ports in the region — including New Orleans, Gulfport, Pascagoula, Mobile and Pensacola," Debbie says. The hurricane response team at the federal Bureau of Safety and Environmental Enforcement issued a statement saying that offshore oil and gas operators in the Gulf of Mexico have evacuated platforms and rigs in response to Hurricane Nate. Personnel from some 301 production platforms (40.84 percent of the 737 manned platforms in the Gulf of Mexico) have been evacuated. "From operator reports, it is estimated that approximately 92.34 percent of the current oil production in the Gulf of Mexico has been shut-in, which equates to 1,615,966 barrels of oil per day. It is also estimated that approximately 77.01 percent of the natural gas production, or 2,479.64 million cubic feet per day in the Gulf of Mexico has been shut-in." Facilities will be inspected after the storm has passed. On Friday, President Trump approved an emergency declaration for Louisiana, authorizing the Department of Homeland Security and the Federal Emergency Management Agency to coordinate relief efforts. The governors of Florida, Alabama and Mississippi have all declared states of emergency ahead of the storm. "Regardless of where the storm makes actual landfall, we face the possibility of widespread power outages and storm surge flooding," Mississippi Gov. Phil Bryant said in a statement. "I ask everyone to please have a plan, especially those that live in mobile homes and low-lying areas." 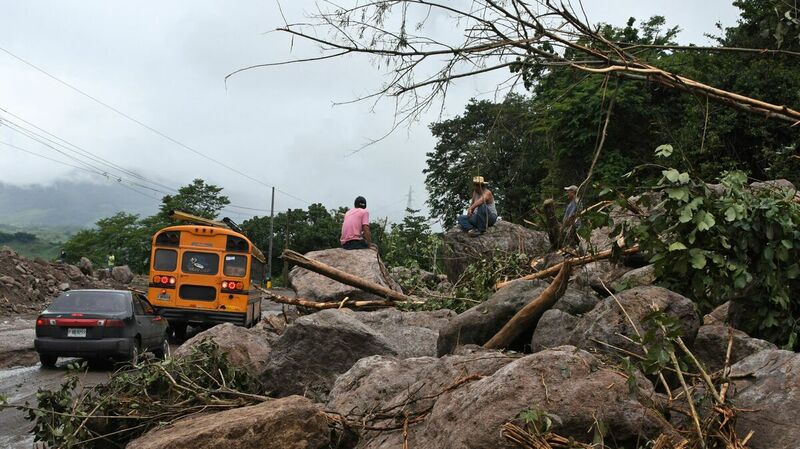 Earlier in the week, Nate was a weaker tropical storm, but heavy wind and rain and subsequent flooding were blamed for several deaths in Nicaragua, Costa Rica, Honduras and El Salvador. NPR's Debbie Elliott and Maquita Peters contributed to this report.